July 3, 2012 - PRLog -- New York, NY (July 1, 2012; MUI-­‐The Public Relations Company)␣Be Chic. Be Delicious. Be Elegant. Be Flirtatious. Be Glam. Be Luxurious. Be New School (or better yet), Be Old School. Be Pop Culture. Be Posh. Be Super Lux. 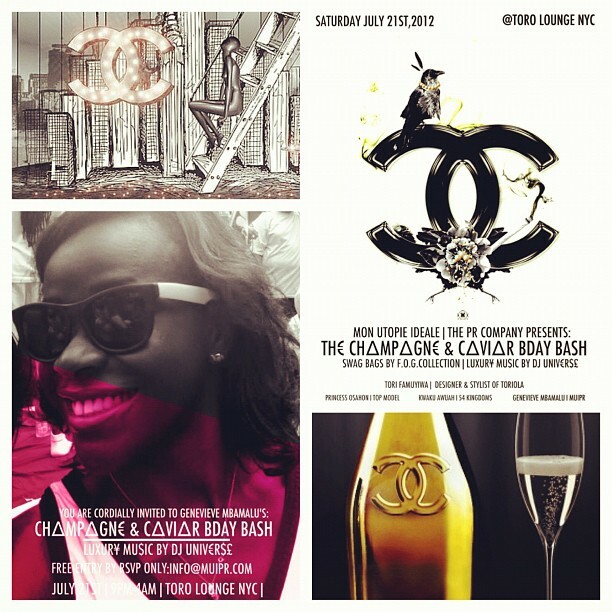 Be whatever rocks your mind at the inaugural launch of the Champagne & Caviar event on Saturday July 21, 2012, from 10PM-­‐3AM, Plein Sud-­‐Toro Lounge inside the Thompson-­‐Smyth Hotel (85 West Broadway, Tribeca, Manhattan, NY). The Plein Sud-­‐Toro Lounge offers an opulent environment for the event␣plush red sofas, brown leather chairs, a baroque themed décor, and a fully stocked bar with premium cocktails. The Champagne & Caviar event is a unique and unadulterated affair developed by MUI-­‐ The PR Company and presented by one of its clients, Afro-­‐Electronic Dance Music creator, DJ Universe, to celebrate life and quality education. The kick-­‐ off event will celebrate the life of three iconic New Yorkers: Princess Osahon, coveted African model known for her gait and grace on the runway; Kwaku Awuah, co-­‐founder of 54 Kingdoms, a fashion house that leverages aesthetic innovations from Africa to create an entirely different esthetic for mainstream fashion trends in NYC; Genevieve Mbamalu, publicist at MUI-­‐ The PR Company, a newly-­‐formed public relations and promotions company in NYC. The event also celebrates access to quality education for disenfranchised children in Africa. The MCF Academy is a tuition-­‐free boarding school for Liberia's vulnerable and at-­‐risk youth, especially orphaned and abandoned children. Guests are encouraged to make a donation to the MCF Academy. MacDella Cooper, founder of the MCF Academy, is emphatic when she talks about the good that the school has done in Liberia through the years. "There's no doubt that the MCF Academy has been able to turn around many children through its access to quality education, but there are many more to reach." Nicole Nadal, assistant publicist at MUI PR says that "This will not just be a fun night for our guests, but by contributing to the MCF Academy, we will energize and empower them to see to it that no child is left behind," she added. "Indeed, celebrating life and access to quailty education are at the heart of what we intend to do through the Champagne & Caviar event." From 10PM to 10:30PM, guests will enjoy complimenary caviar and Moet Rose Nectar Champagne. For the remainder of the evening, guests will receive complimentary gift bags from the Champagne & Caviar event elite sponsor FOG Collection-a luxury t-shirt and beauty fashion company, enjoy premium drink specials, and dance to Afro Electronic Dance Music by DJ Universe. The celebration will also feature a performance by the brand new music group, "The Afroteric Hip Hop Crew" with lead vocals by the Imperial Mandela Rose and beats by DJ Universe. A limited number of advance tickets are available for free by sending an email to info@muipr.com no later than July 19. Though admission to attend the Champagne & Caviar event is Free, guests are encouraged to make a monetary donation tot he MCF Academy. Donations can be made at https://www.paypal.com/cgi-bin/webscr?cmd=_s-xclick&hoste.... Please join us on Saturday July 21, 10PM-3AM to celebrate life with some of the most powerful people in NYC.